Nomads were travelling around Central Asia probably by 50,000 BC or so. By 24,000 BC, if not earlier, these nomads had split into at least two different groups that spoke different languages – one group spoke proto-Indo-European and the other group spoke proto-Altaic. DNA analysis shows that some of the proto-Indo-Europeans, who we call the Yamnaya, married East Asians, and their descendants crossed over to the Americas, either over a land bridge or in small boats, or both, about 20,000 BC. They become the Native Americans. By about 5000 BC, the Yamnaya seem to have lived mainly in the south, around the Caspian Sea (modern Georgia and Armenia), while the Altaic speakers lived further north (modern Russia and Mongolia). Around 3000 BC, the Yamnaya figured out how to tame horses and use them to pull chariots. Chariots and horses made the Indo-Europeans much more powerful, and richer – they could take care of more cattle, and they could conquer other people by shooting arrows and throwing spears from their chariots. Some of the Yamnaya left their homes and settled far to the east, in what is now western China. Others travelled west and settled Europe as the Celts. Meanwhile, the Altaic speakers also learned how to use chariots and horses, and began a long series of raids on China to their south. Around 2000 BC, another set of Indo-Europeans left Central Asia. Some went west again, and became the Greeks and the Romans and the Germans. Others went south and became the Hittites. By 1200 BC, some Indo-Europeans moved south into what is now Iran, where they became known as the Persians, and still further south into India. Some went further east and became the Sogdians. Some of them seem to have ended up in China, where they brought their chariots and horses to the Shang Dynasty emperors. About 800 BC, people in Central Asia figured out how to ride horses in war and formed the first cavalry units. Horse-riding Indo-Europeans in Central Asia began to call themselves the Scythians. We hear about the Scythians (SITH-ee-uns) from the Greek historian Herodotus, who describes how they used their horses to keep sheep and cows in the area north of the Black Sea (modern Ukraine and Russia). Two other Indo-European groups, the Medes and the Persians, used their horse-riding skills to form the world’s first big empire: the Persian Empire. 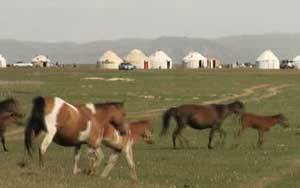 Further east, horse-riding Altaic speakers began to attack northern China. In order to defend China against these attacks, Eastern Zhou emperors also formed cavalry units. It was hard to breed enough good horses in China, so the Chinese emperors started buying a lot of horses from the Sogdians in Central Asia. 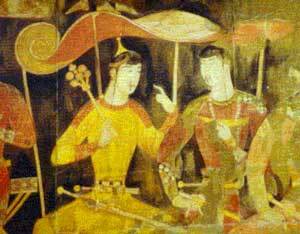 Chinese traders exchanged bolts of silk cloth for the horses (and probably for good iron weapons too), and the Sogdians sold some of the silk to the Persians to their west. This helped to get the Silk Road started about 400-300 BC. Cite this page: Carr, K.E. Scythians and Sogdians – Early Central Asia. Quatr.us Study Guides, May 31, 2017. Web. April 25, 2019.